For nearly a decade, residents of the Gitaldaha II gram panchayat area in Cooch Behar district have been living under the fear of losing their land and livelihood due to land erosion by the Dharla river which passes through Gitaldaha. 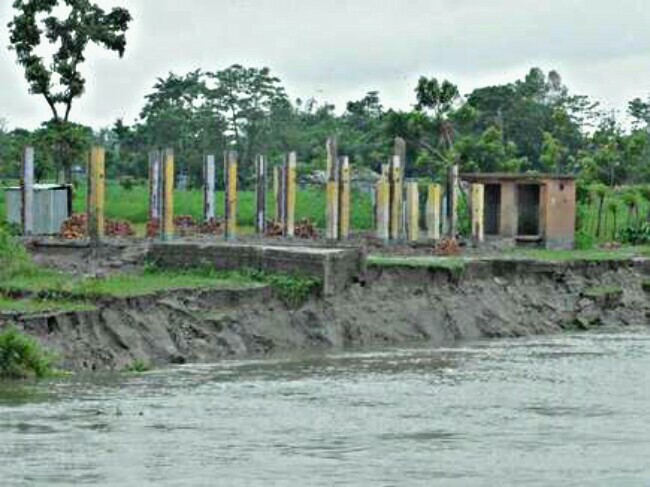 At least 1,000 people in Dinhata I block have lost their homes in the last one decade as the river has swallowed their land. Speaking to The Hindu, locals said: “Villages of Bhoram Payasthi Purba (East) and Bhoram Payasthi Paschim (West) are on the verge of being swallowed up by the river, putting the livelihood of nearly 10,000 residents at stake.” The situation has become worse as the river keeps changing its course. The erosion of river banks mainly takes place from July to October after the water from the monsoon subsides and the brittle soil on the river bank collapses. “The river bank erosion in Gitaldaha has become a cause for concern for us. 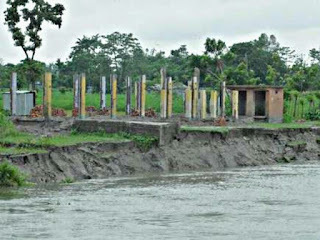 We are keeping an eye on the situation,” said Block Development Officer (Dinhata I) Partha Chakraborty, adding that the situation is going to get even worse after the monsoon. Locals accuse the State Government of neglecting the issue. “It is only during the polls that these party leaders show up. They are not bothered whether we live or die after the polls are over,” said Rahim Miea (35), a resident of Boraiberi village, who lost his house due to land erosion by the river last year.
. “Since locals have to keep shifting their homes, it has become difficult for them to continue their children’s education,” said a senior officer on conditions of anonymity. As for the impact on employment, he said since the locals are mostly farmers and agricultural labourers, it has become difficult for them to sustain their livelihood as large stretches of farm land have been swallowed up by the river. However, State Irrigation Minister Rajib Banerjee said that “tender has been floated for setting up river embankment in the area and work will begin soon”.